Many of us are hungry. When it comes to life, the size of appetites and differences in taste vary, but one thing for certain is that many of us are hungry. Our desire for more is beyond casual. Beyond greed, and deeper than vanity, we are hungry for the FREEDOM to dictate our own movements. We resent the idea that there are levels of achievement where we are only permitted to window shop. The wilderness between point A and point B-whatever your want is our mind’s battle ground. Some of us thirst for the ability to control enough resources to deliver massive positive impact on the world. Our plans to give are larger that our desire to consume, and we are not convinced that living a life lack and limitations is acceptable or particularly honorable. The weak chase money, but we are hunting for autonomy. The freedom to choose how we want to live life rather than being forced to live within limits. It is not that we intend to spend millions purchasing a private jet or island, but we want to know that our resources make that option available for the taking. Please understand, this is not greed. This is a recognition that untapped wells of greatness are hidden within us. Imagine being locked in a jail cell. The key to your freedom is tucked away somewhere on your person, but for some reason you can’t find it. Even worse for some, we have found the key, but fear, hesitation, misfortune, bad relationships, or some other element keeps hindering us from opening the door to freedom. Well here is some humble advice as a friend on the journey. There comes a time when you have to get out of your own head. Reading books, sharing motivational quotes, attending conferences, listening to podcasts and stories of other people’s success will not get us there. Take a moment of silence. Meditate on all the things you desire acquire and all the ways you want to bless the world with your talents. Now recall the sickening frustration of not being where you want to be in life. Finally ask yourself WHY you want a different reality? You see that why? Make a decision right now that it is no longer a dream. You are one side of the room, and your why is on the other side waiting. Today is the day we wake up, stop dreaming, and TAKE ACTION. This not a game anymore. This is a jungle and we are on the hunt. It is time to DO. Perfection will come with practice, not research. You can read books about being a musician all day, but the only way to sound amazing is to get in the game and START PLAYING! Whatever your goal is, this is moment where we commit to taking at least three (3) conscious actions toward unleashing greatness and grasping that WHY. Today we lay procrastination to rest and awaken the might champion within us. Get a journal and write down what you did today and what you plan to do the next day. 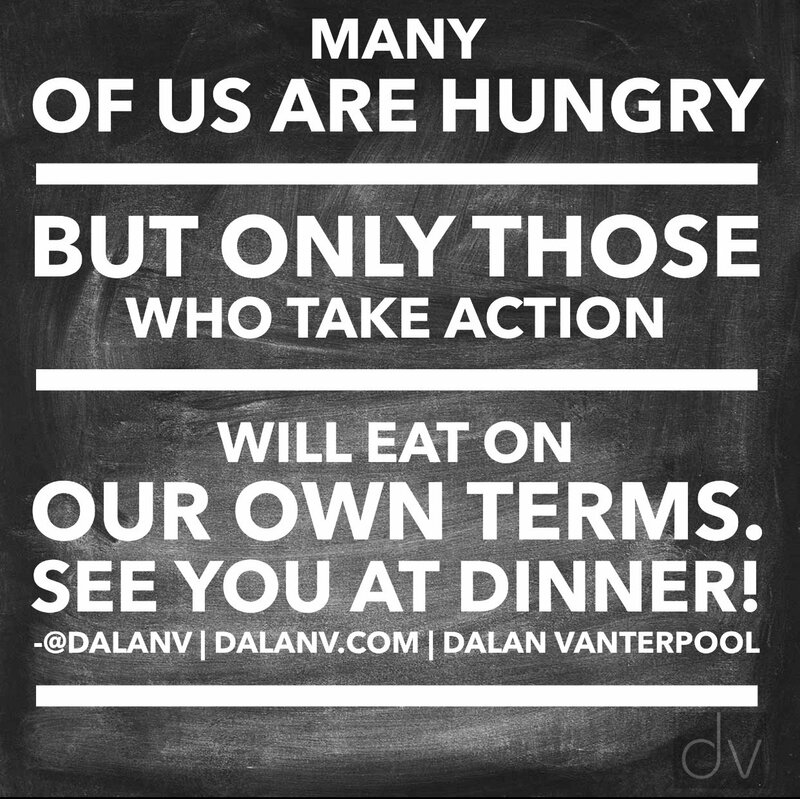 Many of us are hungry, but only those who take action will eat on our own terms. 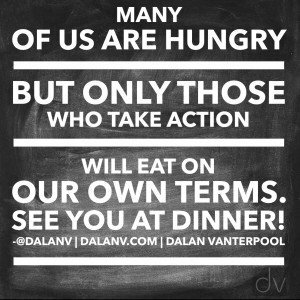 See you at dinner! If any part of this message resonates with you we’d love to connect and share more amazing free content to help you focus the fire. Click here to subscribe today.